I love watching my students work together on a common goal - especially when that goal is producing the best work they can. 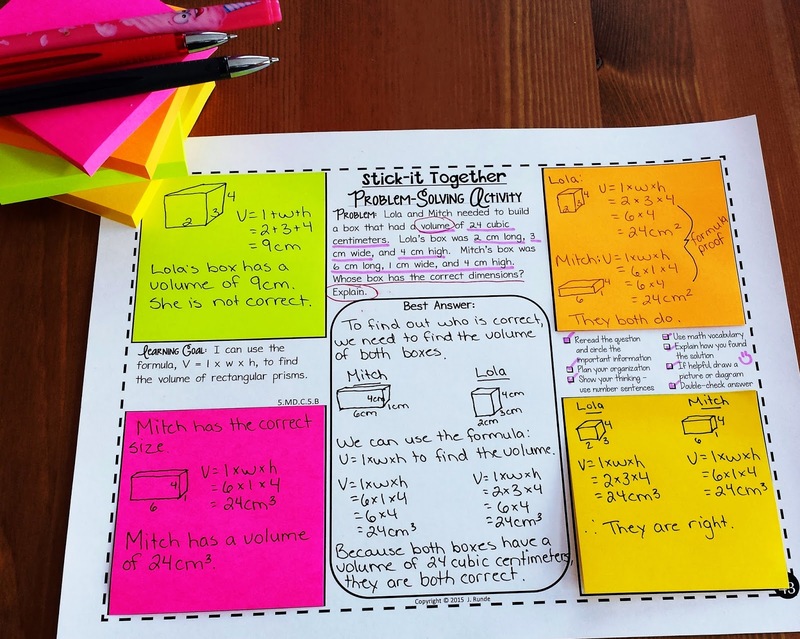 I've been doing activities similar to my Stick-It Together resources for a while in the classroom. Students work in groups of 4. Each student in the group individually answers the problem or question on a sticky note. They then place all their sticky notes on a common page and read through the answers. Taking the very best parts of each person's answer, they discuss and work together to build the best possible answer they can. I've done these types of activities in both language and math, and a variation of this activity is included in my Building Better Responses resources. Earlier this year I created my first Stick-It Together Resource - a collaborative activity for reader responses. Soon after, I began to get requests for a similar resource for math. So here it is ... my Stick-It Together for Collaborative Problem-Solving. The resources are specifically geared to the common core standards - with one question for every single standard. (I have completed 4th, 5th and 6th grade resources already. Working on other grades is next on my list). 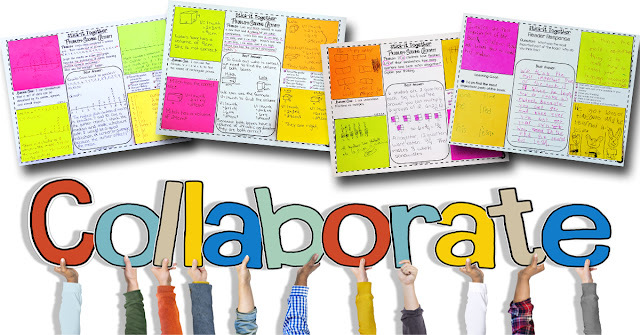 Each page contains a problem geared to a specific standard, an "I can ..." learning goal, problem-solving success criteria, space for students' individual sticky notes, and a space for the students to build their best collaborative answer. Also included in the resource are levelled exemplars for students to see and discuss what makes a level 1, 2, 3, and 4 response. There is also a rubric for assessment, and an answer key. My students love working together on tasks like this, and I love the collaboration and team work skills they build ... not to mention the review of concepts and help from peers. When groups complete the task, I like to project their work over the whiteboard and let them present their final responses to the class. They can take turns explaining how they arrived at the answer, and why they believe they accomplished the task of building the best answer they could. You can take a peek at my newest resource by clicking HERE or on the picture to the right. Take a peek at some of the sample pages from the resource below. I really hope you are able to create these for 3rd grade! Me too! These are amazing!!! Please create some for 2nd grade. Great Idea!! I look forward to getting those for upper grades!! I am high school math educator. This would be truly awesome! !